Three Immokalee men are accused of home invasions in Collier County and the Orlando area in 2014. Nine jurors have been selected in the trial of the men as of Wednesday, May 3, 2017. The proceedings will resume Thursday with opening statements and the first witness testimonies for the prosecution. All 3 defendants back in court again: Henry and Johnathan Contreras in button-downs. Andres Perez in suit and tie. All 3 shackled at ankles. We're just waiting on the last defense attorney and the jurors. In the Orlando area, local media referred to the suspects as "ninja" robbers because they were masked and dressed in black. Also armed. About to start. Prosecution will give opening statement. 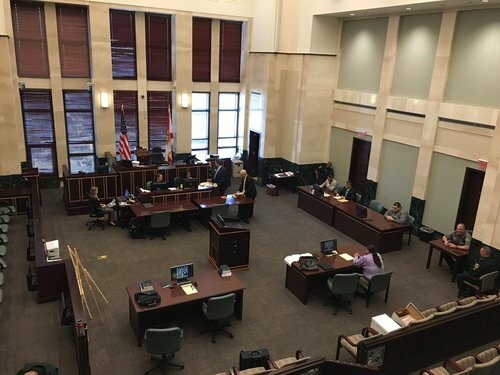 As will Naples-based defense attorney Landon Miller for his client Henry Contreras. The other two defense attorneys, Orlando-based Roger Weeden and public defender Javier Chavez, will reserve opening statements for later. State outlines both the successful home invasion in Windermere and the attempted break-in Orlando area, which happened 3 years ago. 1st witness for state: David Diaz who installed surveillance system at William Kitchen's Windermere home that was burglarized. Diaz now showing jurors where the surveillance system was installed on Kitchen's home based on a building sketch of it. Diaz says he installed cameras for Kitchen in the casual dining room, kitchen and living room on 1st floor. Cameras use infrared to sense heat in the dark. Diaz also installed cameras on 2nd floor outside master bedroom and in Kitchen's office. The cameras are always on but don't record everything. Only relevant data is stored, Diaz says, meaning changes in light or movements. Prosecution now showing jurors snippets from the surveillance footage from the home invasion at Kitchen's home. Defense objects. Sidebar. Camera footage shows the living room. For a moment we saw a person enter. Now we get to see the full video, which only lasts a few seconds. A person can be seen walking through the living room. Person appears to be masked but hard to tell because the infrared shows it in black and white. Diaz is dismissed and prosecution calls William Kitchen, the home owner, as a witness. Kitchen is founder and chairman of a company that designs and builds rollercoasters. Kitchen lives there with his partner Camilo Espinel. Kitchen now showing and describing the building based on aerial photos of the spacious lakefront home and property. Kitchen now recounting the events from April 30 when the home invasion took place. He and Camilo came back from dinner around 10 pm. April 30, 2014, that is of course. Kitchen is now being asked about his beagle-pit bull mix that was at the home that night. Objection from defense. Sidebar. Kitchen: Got home that night and had a gun in my face. "I really thought I was going to get shot." Gets emotional. Kitchen says the robbers were dressed in black head to toe in "ninja outfits." Kitchen: Before anything was said Camilo handed robbers his watch. Then the men zip tied their hands together. Kitchen: Robbers told us to comply and nothing would happen to us. Directed them to take care of the dog and put him upstairs. Then entered. Kitchen: One person was the leader and did most of the talking. They wanted to be taken to the safe. Both Espinel and Kitchen have their hands tied behind their backs. Kitchen: Robbers led them into kitchen, told them they wanted the safe. Said that a neighbor had told them there was $300K in the safe. Kitchen: Told robbers that they would be disappointed bc only some trinkets and candy in the safe. Espinel had to lead them to safe. Kitchen: One robber came out with only a couple hundred dollars. Took Kitchen's glasses and stomped on them. Kitchen: Robber said that same thing that happened to glasses would happen to him if they didn't find the rest of the money. Kitchen: We had pillow cases put over our heads. "That was the most terrifying moment."